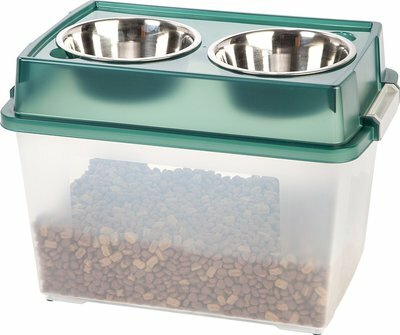 If you want a dog food dispenser that will hold 40 pounds of dry kibble that is under your control, in other words, not an automatic dispensing machine for timed meals, you can get these models that will save on your back and neck every time you need to refill their bowls with less mess too. 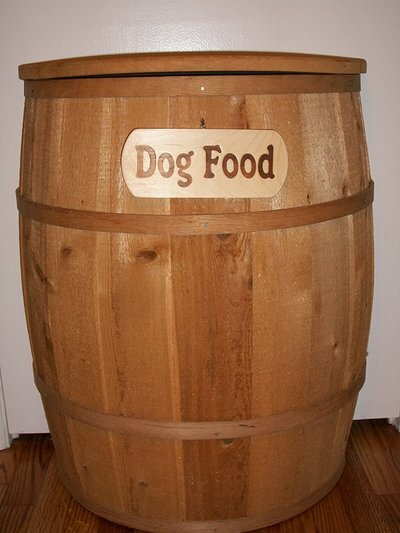 These are wall mounted which is perfect if your space for dog food storage is at a premium. You fill this machine one time and then when dinner arrives their is no fighting with that bag in the corner or the closet, and the best part is that the food stays fresh. If you like to have control over your pets eating habits, but want a convenient way to store the food, this wall mounted unit has many good reviews. As you can see in the picture, you simply pull the lever to get out the desired amount of food for your pooch or pooches. With it being wall mounted they can't steal any and the food stays safe and dry and off the floor and out of the cabinets and closets. This model will hold 40 pounds of dry kibble. This brand holds 40 pounds of kibble as well and is wall mounted. Fill once and then simply dispense as needed. These are not automatic so this is more for you if you want easy access storage and control over their meals. 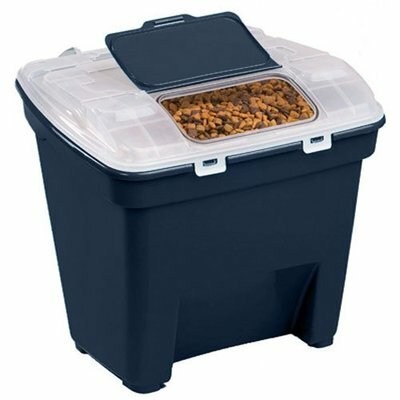 If you can afford the floor space in your closet or any other area, this air tight containers is designed to hold 42 pounds of dog food, you can even get a larger capacity one. It is on wheels making it easier to roll out when it is time to feed your pets! This air tight vaults will hold 40 pounds of dry kibble and can also be stacked making them perfect for the multi pet family. You can have the different types of food in each one, and these can be stacked and stored in a corner or a closet. You can keep cat food, dog food or even their treats all in separate air tight containers rather than having bags and boxes all over the place. If you have a few pets, getting routines figured out is top priority for stopping chaos at feeding times. You can invest in automatic dog feeders that you simply fill with the kibble and then place on a timer for your pooch, or you can simply store them in containers that are air tight or attached to the wall. Leaving your dog food in the original bag will not only send the food stale but will also attract bugs (been there done that) and I find pet food expensive enough without having to throw half of it away. You can quite often get super deals on larger sized bags but once opened they can be easy food for bugs even if you fold the tops down, plus it gets cumbersome hauling out the different foods. Invest in a container that will hold the size you would like and then simply dump it into the container on shopping day. This keeps the food ready, clean and easier to store.